It's hard to believe but another year has zipped past us and 2012 will soon be history. 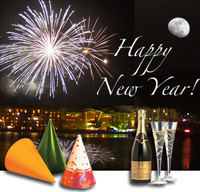 New Year's Eve in KC will fall on a Monday night this year and we will ring in the new year of 2013 with many parties, celebrations, events and get togethers. At KCMB News we have the scoop on some of the hottest New Year's Eve 2013 events in Kansas City, and would like to share just a few with all of you! This year the P&L downtown will feature one of the greatest dueling pianos acts in the Nation, and the party will be going nonstop all night long. Dueling pianos has grown extremely popular in the Kansas City area and on New Year's Eve in KC 2013, they will be kicking up a storm down at the Power and Light District. Hailing from Los Angeles, California, one of the hottest show bands in the Nation, The Dave Stephens Band will be performing at the swank new Kill Devil Club at 61 East 14th Street in downtown Kansas City. For more information on the Dave Stephens Band New Year's Eve KC 2013 celebration, call 816-588-1132. Are you having an event you would like posted? If so, visit our New Year's Eve KC 2013 site to enter your event information. Thank you, and have a safe NYE Kansas City! New Year's Eve KC 2013 info by KCMB Kansas City News, official kc news site with breaking stories on The Kansas City Royals, Chiefs, charity events, the 2012 MLB All Star Game, weather, sports, MU, KU, ufo sightings, dui checkpoints, Kansas City neighborhoods, nightlife, concerts, the Sprint Center, the Power and Light District and current Kansas City news articles.